SOCHI, Russia (AP) — Unlike the other World Cup favorites that struggled through their opening matches, Belgium looked every part the title contender. Having Dries Mertens and Romelu Lukaku capable of scoring the way they did against Panama helps. "People know I am supposed to score goals," Lukaku said. "The most important thing to me is to win matches." Lukaku scored twice in a six-minute span in the second half after Mertens' perfectly struck volley gave Belgium the lead, and the Red Devils beat overmatched Panama 3-0 Monday. Saddled with massive expectations and a lineup of talent the envy of other teams in the tournament, Belgium showed flashes of being a team worthy of title consideration. 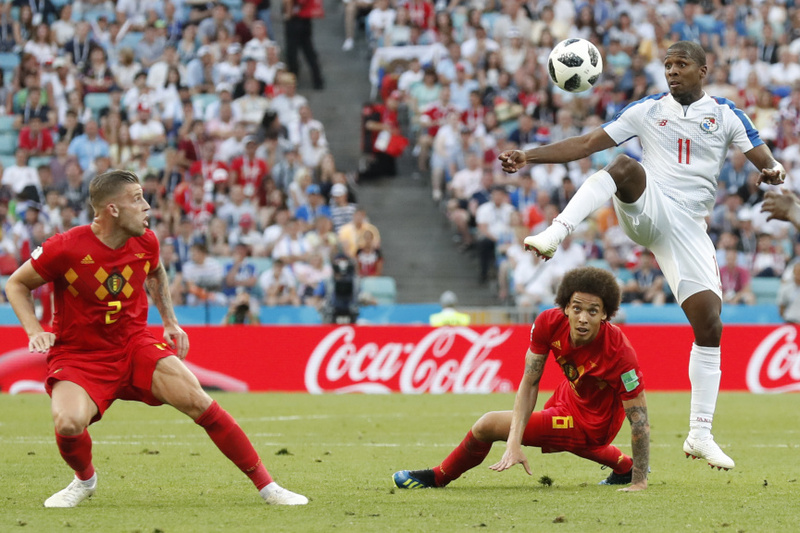 A shaky first-half performance by Belgium was replaced by a confident, attacking group in the second that was finally able to find gaps in Panama's defense and convert those chances into goals. "In the World Cup you have to play 90 minutes. You have to be aware that in any game you go into, if you don't score early on, you have to be prepared to work hard and go through periods in which you are tested," Belgium coach Roberto Martinez said. The two goals from Lukaku came shortly after Mertens scored from about 18 yards in the opening moments of the second half, finally relieving some pressure after Belgium was unable to break down Panama for the first 45 minutes. Lukaku's first goal came 20 minutes later, but the pass from Kevin De Bruyne made it possible. Rather than shooting through a crowd of Panama defenders, De Bruyne cut a pass with the outside of his right foot onto Lukaku's head and into the net. Lukaku added a second on a breakaway minutes later, chipping Panama goalkeeper Jaime Penedo as he left his net. "For me it's important to have the right line in the box," Lukaku said. "Usually I'm in the right position at the right time." Belgium is now unbeaten in its last six World Cup openers, dating back to a 1986 loss to Mexico in the opener. Panama was unable to duplicate what Senegal accomplished in 2002 as the last team to win in its World Cup debut. The Central Americans played their style — physical, aggressive, sometimes looking more like wrestling than soccer — and managed to hang with the Red Devils for more than an hour. But they never created threatening scoring chances — Panama scored only nine goals in 10 World Cup qualifying matches — and eventually Belgium finished its opportunities. The emotion was heavy for the Panamanians who flocked to the Black Sea resort town to see the country play its first World Cup match. Fans cried at hearing their national anthem and the players on the field fought their own emotions while singing. Their voices rose with every Panama attack and the singing and dancing almost never stopped. Panama's players stayed on the field to salute the fans several minutes after the match ended. Luminaries like Panama President Juan Carlos Varela Rodriguez and baseball star Mariano Rivera were in attendance. They would have just preferred something a little less challenging than one of the pre-tournament favorites. "It was very moving to be able to sing the national anthem and represent our country," Panama captain Roman Torres said. "It was historic what we went through here today." Even if it wasn't pretty for a half, Belgium did what it was supposed to do in Group G. The victory keeps the team on track for its final group match against England, which is likely to determine the top spot. Panama needs a result against England if it wants any opportunity of the final group game against Tunisia to have meaning. Belgium was finally able to finish its chances after seeing several attempts in the first half end up in the side netting or punched away by Penedo. Panama's defense was stingy but also disorganized at times and became even more susceptible after Mertens' goal forced Panama to push forward looking for an equalizer. Eden Hazard was continually chopped at by Panama's aggressive defense and was a regular recipient of fouls. Martinez said the amount of hits Hazard took is a concern. Panama was called for 18 fouls and shown five yellow cards. "My worry is that maybe in one of those tackles we're going to lose the opportunity to enjoy the quality of a player like Eden Hazard," Martinez said. "That's not just Eden but any player." "It's true that there is a huge difference between Belgium and Panama, so it could have been worse than three goals. It would have been terrible for more goals. No one likes losing. But considering our history, and our opponent, I think our boys should be happy. I told them they played with dignity." -- Panama coach Hernan Dario Gomez.